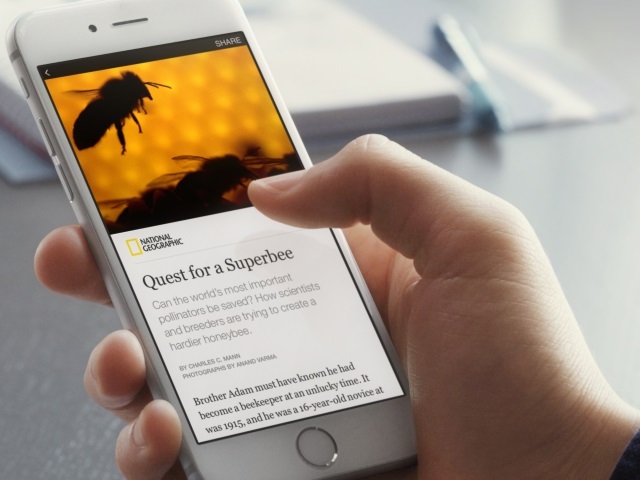 Facebook teamed up with nine publishing partners to launch interactive Instant Articles, available via its iPhone application. The feature launched Wednesday with “a special set of stories” from The New York Times, BuzzFeed, National Geographic, NBC and The Atlantic. As more people get their news on mobile devices, we want to make the experience faster and richer on Facebook. People share a lot of articles on Facebook, particularly on our mobile app. To date, however, these stories take an average of eight seconds to load, by far the slowest single content type on Facebook. Instant Articles makes the reading experience as much as 10 times faster than standard mobile Web articles. Along with a faster experience, Instant Articles introduces a suite of interactive features that allow publishers to bring their stories to life in new ways. Zoom in and explore high-resolution photos by tilting your phone. Watch auto-play videos come alive as you scroll through stories. Explore interactive maps, listen to audio captions and even like and comment on individual parts of an article in-line. On the subject of ads, The Wall Street Journal reported earlier this month that if Facebook sells those ads, it will command its standard 30 percent fee. I’m really excited to share a new project (graphic design lead Sharon Hwang) and I have been working on for the past year. This journey really started for me years ago when (media engineering manager Kimon Tsinteris) and I started Push Pop Press, and I’m really excited to continue today with the launch of Instant Articles — a new way for publishers to create fast, interactive articles on Facebook. We’ve brought a bunch of the learnings (from Paper) into this product. Speed is often the most important feature of what we build on a mobile phone. We have gone through and optimized and sped up all the core experiences of using Facebook: loading News Feed, loading photos, loading videos. The last thing that takes a long time to load in your News Feed is articles. We’ve all had the frustration of just looking at a blank screen and waiting for something to load. On average, it takes over eight seconds to load. Fundamentally, this is a tool that enables publishers to provide a better experience for their readers on Facebook. Instant Articles lets them deliver fast, interactive articles while maintaining control of their content and business models. (Publishers) can have the same tools that an app developer has. They’re not stuck with what the mobile Web can offer. The New York Times already has a significant and growing audience on Facebook. We’re participating in Instant Articles to explore ways of growing the number of Times users on Facebook, improving their experience of our journalism and deepening their engagement. We have a long tradition of meeting readers where they are, and that means being available not just on our own sites, but on the social platforms frequented by many current and potential Times users. It is great to see Facebook trialing new ways for quality journalism to flourish on mobile. The Guardian is keen to test how the new platform can provide an even more engaging experience for our readers. It is then vital that, over time, Instant Articles delivers recurring benefit for publishers, whose continued investment in original content underpins its success. We were wary when Facebook first approached us about this opportunity last year. But the more we talked with their team, the more comfortable we became. We believe the hosting program will help us reach a bigger audience yet … And since we are able to sell ads into the Facebook template and keep all of that revenue, we’re building our business. Readers: What are your initial impressions of Instant Articles?